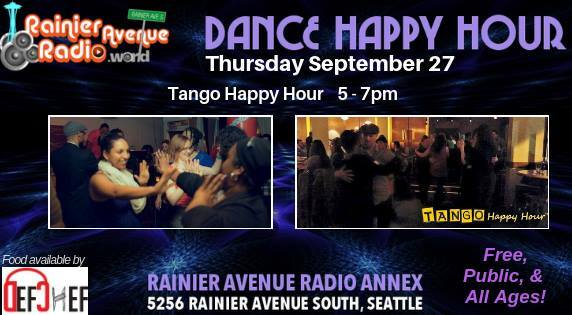 Rainieravenueradio.world welcomes the community to our new Annex with Dance Happy Hour! Join us as Gabriela Condrea of Tango Happy Hour (seen Tuesdays at Amber Lounge in Belltown) teaches fundamentals of the classic Argentinian partner dance...it's going to be a Dance Party! There will be a live broadcast on www.RainierAvenueRadio.World from 5-6pm, check out live video clips on our Facebook page. Invite your friends...Free & All Ages! Food available to purchase by Def Chef Kitchen. Interested in a vendor booth? Email RainierAvenueRadio.World@gmail.com.